One of my favorite things in the world are leftovers. When I was a kid, I used to eat dinner leftovers for breakfast and lunch. As an adult, when I cook, I love to have leftovers because it means I have homecooked food without having to cook again. Amazing. But we all know the best type of leftovers: Restaurant food. It’s restaurant food! For me, if I order something in a restaurant, it means that it’s something I can’t make myself. So it’s special, and usually delicious. You just bought 2 or more meals for the price of 1. Such a great deal! I recently wrote about my very positive experience ordering the “IDK” (I Don’t Know) menu item from a local cajun-inspired restaurant called The Kitchen Sink. That was exactly 1 month ago. 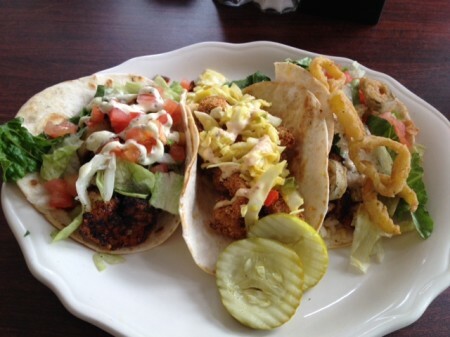 Cajun tacos, three ways: blackened shrimp, po’ boy crawfish, and spicy grilled chicken. SO good. 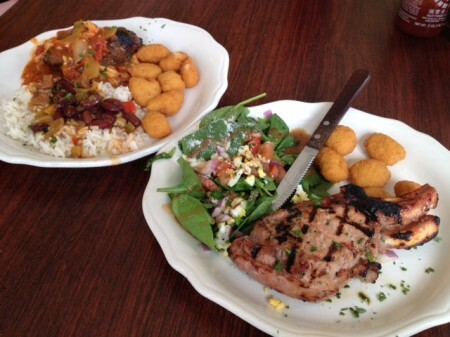 Two IDKs: surf and turf on the left, pork chop on right right. Both were amazing, but the pork chop in particular was something special. This entry was posted on Thursday, May 1st, 2014 at 11:49 pm	and is filed under food, pet please, restaurants, St. Louis and tagged with pet please, St. Louis. You can follow any responses to this entry through the RSS 2.0 feed. I would like to offer a response to the question you posed. I agree 100% that it is great customer service. I think great customer service is the willingness to go beyond the “expected” and give more. Whatever that “more” means to the giver. There is always room for growth in the “more” of the giver. That growth is, to me, the most intoxicating and exciting part. The giver gets the opportunity to become “more” each time AND invites the other to “more”. Vince: Thanks for your comment. I think that’s well said–going beyond the expected. I’d say that growth is, in a way, contagious. Seeing that level of service makes me want to do more for my customers as well.